Let me preface my discussion of Song of the South by assuring you that I understand the issues some viewers have with this film. I know that this film rubs some people the wrong way, and that there are some who would vilify Disney should they ever try to release this film on video or DVD in the United States. But it is my fervent belief that we cannot ignore entire facets of Hollywood history just for the sake of political correctness, because to do so would be to ignore the reflections on our culture, our history, and our society that such movies can provide us. Much as we may want to, we simply can’t pretend that this film–along with other controversial fare such as D.W. Griffith’s Birth of a Nation (1915) or even Gone With the Wind (1939), whose depiction of slavery is equally polemical–doesn’t exist. My childhood memories of the film are vague, at best; I don’t remember how old I was when I saw it, but I loved mischievous Br’er Rabbit and his bumbling enemies, Br’er Fox and Br’er Bear. The stories were fun and brightly animated, and there was nothing deeper at work here for me. I didn’t notice the inherent racism in some segments of the movie; what child would, really? I finally re-watched the film last year for a paper in an African-American literature class–thank you, YouTube and foreign releases–and, with the jaded eye of the academic, noticed some things I most certainly missed in my oh-so-innocent younger years. Yes, there are some disturbing elements at play here. But that in itself does not seem to come from any malicious intent so much as the general ignorance of the time period. 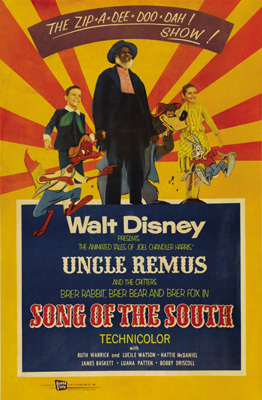 Song of the South (1946) takes place during Reconstruction and revolves around the character of Uncle Remus, who was created by Georgia-born journalist Joel Chandler Harris in the 1880s as a means through which to collect and tell a series of African-American folktales. Uncle Remus is a classic storyteller, relating tales of anthropomorphic animals (much in the manner of Aesop) whose trials and tribulations contain moral lessons for children. There are three animated segments in the film, tied together with live-action segments featuring Uncle Remus and three curious children named Johnny, Ginny, and Toby. 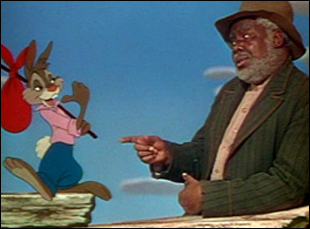 When Johnny runs away from home, Uncle Remus finds him and tells him stories about sly Br’er Rabbit, who devises clever ways to get out of trouble. Uncle Remus and Johnny become fast friends, with Johnny coming to rely quite heavily on Uncle Remus and his stories to get through his disappointment at his parents’ separation. These animated segments provide a comical juxtaposition to the seriousness of the live-action plot, in which young Johnny deals with bullies, his disillusionment about his parents, and even an attack by a rampaging bull, which nearly kills the child. The first animated vignette, “Br’er Rabbit Runs Away,” includes the famous tune “Zip-a-Dee-Doo-Dah.” Br’er Rabbit decides to leave his briar patch and run away from all of his troubles. But as he begins his journey, he is snatched up in Br’er Fox’s snare trap. As the fox sharpens his axe for the kill, the dimwitted Br’er Bear ambles along and the rabbit tricks the bear into freeing him. After a slapstick free-for-all, Br’er Rabbit hightails it back to his briar patch, content to stay put after seeing all the trouble the world away from home has to offer. In the second animated segment, “The Tar Baby,” Br’er Fox and Br’er Bear construct a figure made of tar and dress it in clothing to disguise it as a real person. When Br’er Rabbit hops along and becomes insulted by the figure’s refusal to return a friendly greeting, he punches it and becomes stuck to the tar, much to the culprits’ delight. 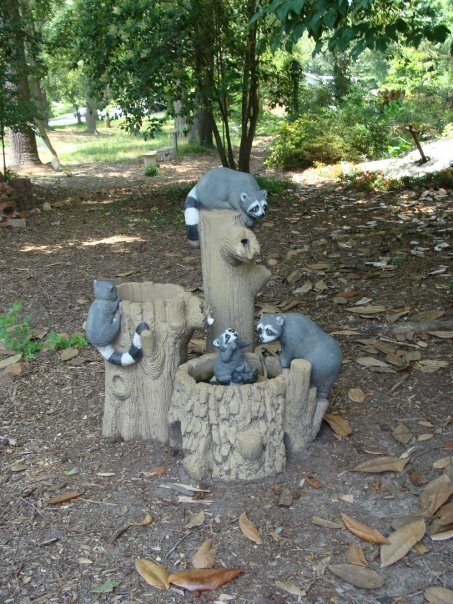 Unable to get free, he instead tricks his adversaries into throwing him into the briar patch, repeating, “But please don’t fling me in that briar patch!” over and over again. The reverse psychology works, and Br’er Rabbit easily escapes. The term “tar baby” has since come to have a definitively negative connotation; I’ve actually heard it used in casual (i.e. insensitive) conversation to refer to a person of African-American heritage. But this was not the original meaning of the term. As depicted in this tale, the “tar baby” signifies a (sometimes literally) sticky situation, one from which it is difficult to be extricated. 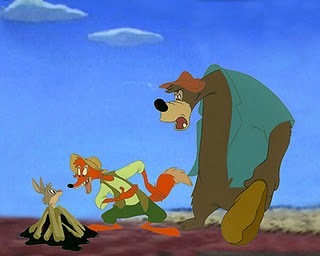 The final cartoon of the film, “The Laughing Place,” finds Br’er Rabbit in the clutches of Br’er Fox and Br’er Bear. Tied to a spit, ready to be roasted, Br’er Rabbit bursts into laughter as the fox puts him over the flame. Br’er Rabbit explains that he was thinking about his “laughing place,” which he says is a secret. Though Br’er Fox is skeptical, Br’er Bear insists on seeing the laughing place. Br’er Rabbit leads them through the forest and tells them the laughing place is in a thicket with an active beehive. 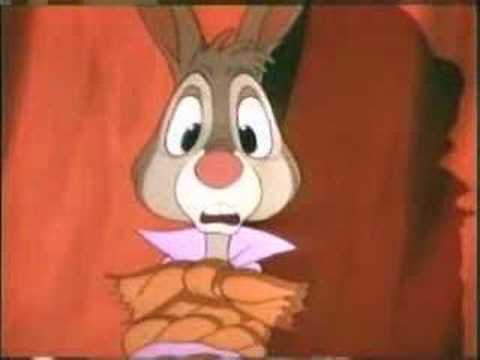 When both of his opponents end up being chased away by bees, Br’er Rabbit is left free, collapsing in hysterics (“I didn’t say it was your laughing place. 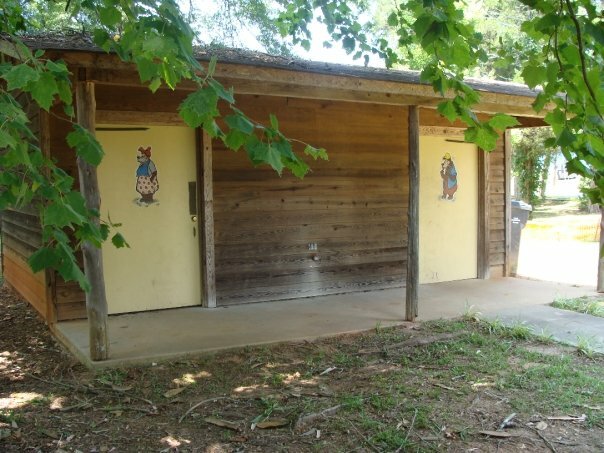 I said it was my laughing place, Br’er Bear!”). Br’er Rabbit is based on the African tradition of the trickster, a character who is anarchic in nature, creating mischief and causing trouble for the sake of dismantling order. He is decidedly physically weaker than his counterparts, Br’er Fox and Br’er Bear, but constantly betters them through the use of reverse psychology and his own quick wits. 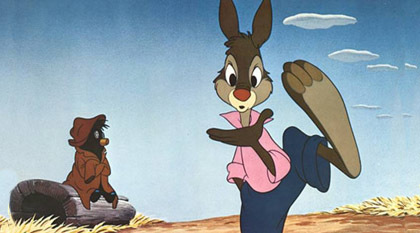 Many critics see Br’er Rabbit as representative of the slave’s ability to undermine and outwit their white masters through similar manipulations of language. Does the film play with stereotypes? Definitely. Does it do so any differently than other films of the time period? Not particularly. Song of the South was released in a time when it was still considered acceptable for performers such as Fred Astaire to don blackface, when African-American actors and actresses were cast mainly in subservient roles like maids, cooks, and attendants (with few exceptions). And like many of its contemporaries, this film’s main weakness lies in its reliance on the predominant stereotypes of the time; the former slaves in the film are depicted as the prototypical “happy slave” figures, satisfied with their deferential roles to their white former masters. The strength of this film, however, lies mainly in good, solid casting, and the actors deliver performances that transcend the at-times racially-insensitive material. 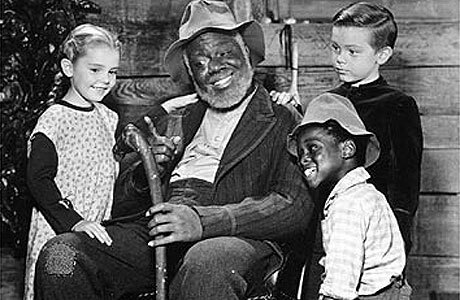 James Baskett is wonderfully charming as Uncle Remus, and though he could not attend the premiere of the film in Atlanta (he could not find a hotel willing to register an African-American), he did go on to win an honorary Oscar for his performance in 1948. Walt Disney himself petitioned for Baskett to win an Academy Award, stating that the actor virtually created the character from the ground up on his own–a truly great feat that resulted in a truly great performance. The film also features appearances by Ruth Warrick as Bobby’s mother, Sally, and Academy Award winner Hattie McDaniel as Aunt Tempy. And let’s not forget the great performances of the child actors, a couple of whom might look familiar to some classic film fans. Bobby Driscoll, who plays Johnny, was featured in several films in the late 1940s and early 1950s, including Treasure Island (1950); he also provided the model and voice for the title character in Disney’s animated version of Peter Pan (1953). Sadly, Driscoll was the essence of the “ruined” child star; he became a drug addict and died at the age of 31. Luana Patten, who played Ginny, starred in several films, including the Disney package films Melody Time (with Driscoll) and Fun and Fancy Free, So Dear to My Heart (1948–again with Driscoll), and 1950’s Home from the Hill, before retiring from film work a decade later (as for the third member of the ensemble, Glenn Leady, who played Toby, this film marks his one and only film appearance). This puts a rather dark spin on the song–for while in Disney’s candy-colored look at life in the South, everything might be “satisfactual,” the reality is much less pleasant. And it makes you wonder what sadness Uncle Remus may be hiding behind those laughing, crinkly eyes. Despite the controversy surrounding the film, the characters are not completely ostracized from their brethren in the Disney animated family. The songs from the film, particularly “Zip-a-Dee-Doo-Dah,” have been recorded by various artists on Disney compilation and tribute albums in recent years, and Br’er Rabbit and crew have even given rise to one of the most popular rides at the Walt Disney theme parks, Splash Mountain (which, incidentally, is also my personal favorite ride–it’s wicked awesome). Overall, if you’ve heard the stories about this movie and have not had the opportunity to see it for yourself, try looking up the clips on YouTube. You may be disturbed by some of the things on screen, but it’s up for debate as to whether the portrayal of African-Americans in this film is any worse than the dozens upon dozens of classic films that deal with the topic in just as insensitive (if not as notoriously) a manner. Side note: when I was in graduate school in Georgia, I lived about twenty miles away from Joel Chandler Harris’ birthplace. It pains me to admit this, but it took me almost a year to actually make it over there to look around–along with Carrie and Nikki, as we had gathered to celebrate my birthday that weekend! The home itself is rather charming (though we were unable to go inside, as it was closed at the time). 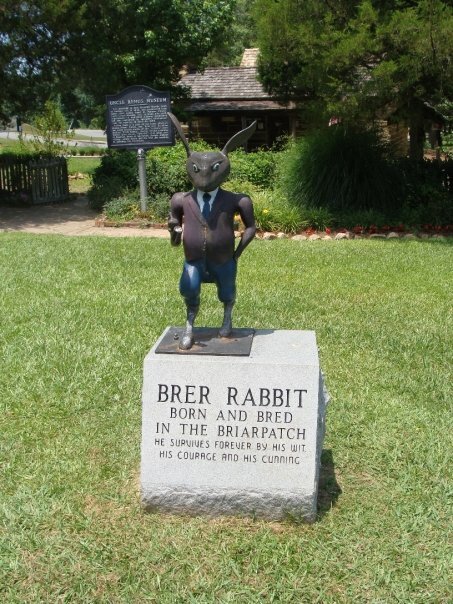 … to the Br’er Rabbit statue sitting out front. 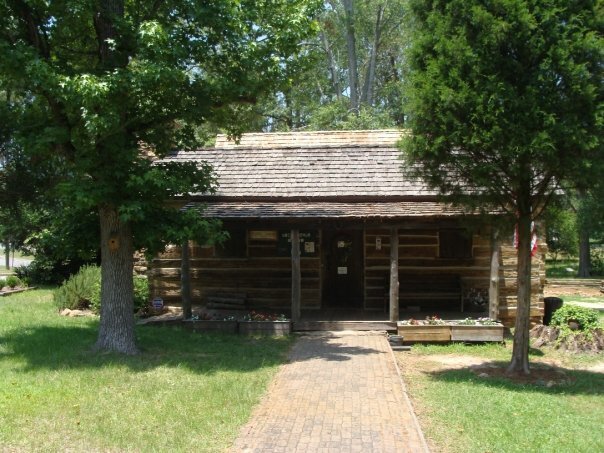 If you’re ever near Eatonton, Georgia (which, incidentally, is also the birthplace of Alice Walker), you should definitely stop by and check it out for yourself. 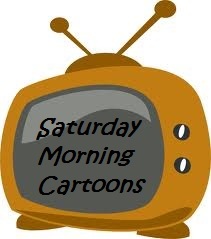 Next week on Saturday Morning Cartoons: Nikki indulges her all-abiding love for Cinderella! ← We’ll go for a jolly ride!